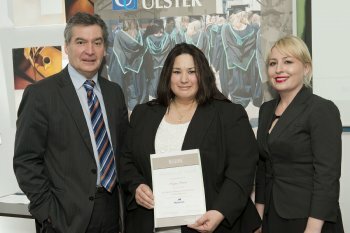 Inaugural Barnett Scholar Maya Frost, centre, receives her scholarship from Professor Richard Barnett, Vice-Chancellor of the University of Ulster, and Christine Crawford of Norbrook Laboratories. Leading Northern Ireland pharmaceuticals firm Norbrook Laboratories has made a gift of £100,000 to the University of Ulster to fund a scholarship of £10,000 each year for the next 10 years. At the personal request of Norbrook Chairman and University of Ulster honorary graduate Lord Ballyedmond, the scholarship has been named in honour of the university’s Vice-Chancellor, Professor Richard Barnett. The scholarship is available to students taking the MSc in Pharmaceutical Sciences within the School of Pharmacy and Pharmaceutical Sciences. The first recipient is mature student Maya Frost, who begins her studies this year. The gift is additional to the £1million given to the University by Norbrook in 2011 to fund the Norbrook Chair in Pharmaceutical Sciences, a post currently held by Professor John Callan. Inaugural Barnett Scholarship holder is Maya Frost. Maya lives in Letterkenny, Co Donegal, and commutes to the University’s Coleraine campus, where she’s working on a non-invasive way to detect electrolytes in blood. It’s a kind of sensor device which Maya – who was formerly a paramedic in Washington State – is convinced could be important and useful for emergency services and front line medical staff in hospitals.